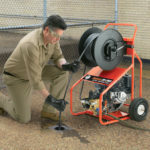 The Handylectric is a tough, easy to use tool for cleaning lines up through 3″. 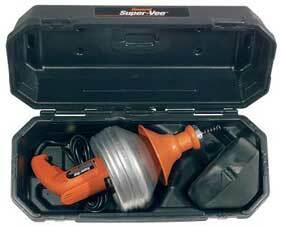 It can use all of the accessories available for the Super-Vee, except the plastic cartridges. Cables are gripped securely by a Quick-Grip™ chuck equipped with a tightening handle, for easy tightening even with slippery hands. The patented chuck tightens firmly on the cable with just a quarter turn. 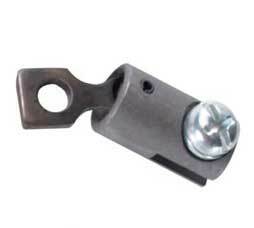 Three chuck jaws securely hold 1/4″, 5/16″ and 3/8″ Flexicore® cable for a wide range of small-line jobs. The variable speed control motor lets you start at low speed to eliminate starting “kick”. Then run at whatever speed is best for the job.The large, comfortable Grip Shield makes handling easier. The stamped aluminum drum can’t rust or crack. • Quick-Grip™ chuck secures cable with just as quarter turn. • Unique Dyna-Thrust™ bearing system for longer tool life. 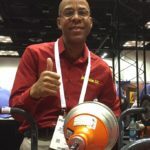 • Holds 50 ft. of 1/4″ or 5/16″, or 35 ft. of 3/8″ Flexicore® cable. The large, comfortable Grip Shield makes handling easier. The stamped aluminum drum can’t rust or crack. 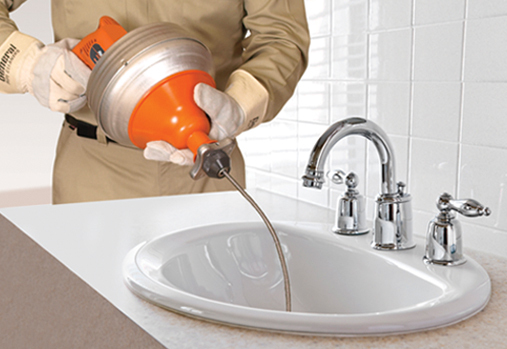 The rugged Handy-Stand turns General’s popular and reliable hand-held drain cleaners into practical countertop or floor machines. Ergonomically balanced for maximum stability, the lightweight portable Handy-Stand fits the Super-Vee®, Power-Vee®, and Handylectric®, All three models are ideal for unclogging sinks, tubs, and laundry drains. The convenient Handy-Stand makes it easier for you to carry your hand-held machine to and from the jobsite. The lift handle doubles as a spare cartridge holder and protects your machine from damage. On the job, the Handy-Stand can be positioned either horizontally or vertically for maximum flexibility. 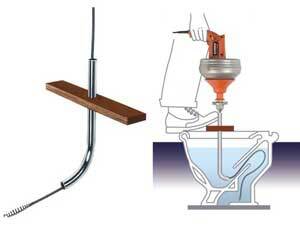 Closet Auger Attachment (Catalog #CAA) Guides 1/4″ or 5/16″ cable into bowl. 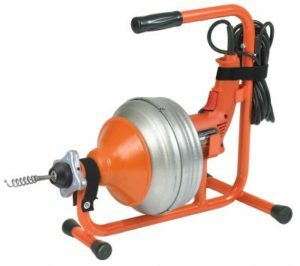 Handylectric with 25HE1 (25 ft. x 1/4″), 25HE2 (25 ft. x 3/8″) cables, and HECS cutter set. Handylectric with carrying case, 25HE1 (25 ft. x 1/4″), 25HE2 (25 ft. x 3/8″) cables, and HECS cutter set. Handylectric with 25HE1-A (25 ft. x 5/16″) cable. Handylectric with carrying case and 25HE1-A (25 ft. x 5/16″) cable. 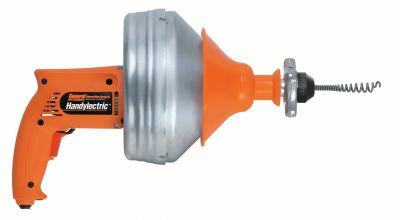 Handylectric with 25HE1 (25 ft. x 1/4″) cable. Handylectric with carrying case and 25HE1 (25 ft. x 1/4″) cable. All ball-bearing, double-insulated, reversible motor with variable speed control; 0-500 rpm. 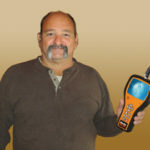 230 and 240 volt units available. Heavy gauge stamped aluminum with inner drum to prevent cable tangling. 50 ft. of 1/4″ or 5/16″ cable; 35 ft. of 3/8″ cable. All cables are left hand wound and reinforced with a wire rope center.